DiRT is back with its third entry to the series. What has changed between the second and the third? That is easy, drift and gymkhana events to start with and since this is mainly a rally racing game there is that other stuff shoved into the disk as well. The show off features of all things rally consist of over 50 cars spanning five decades, 100 plus routes through Europe, Africa, and the US, along with the mud and rain comes snow for the first time. Oh course the fast paced feeling is back that made DiRT 2 my go to racing game for the Xbox 360. Possibly the biggest new feature to DiRT is the introduction of gymkhana to a racing game, and if you don’t know what that is, I highly suggest going to YouTube right now and searching it, as some of the videos have over 15 million views of this driving art form, but we will get into that shortly. Now onto the review to see if the third game still holds up to the dirt loving racing series. I can safely say after competing in over 50 of the available events over the weekend that this is not the same game as DiRT 2, as the new locations do a good job at keeping races fresh. The same white knuckle racing is still there, just as fast as before but with twice the events, that doesn’t even count the replay value found in the online multiplayer. I am still torn on the addition of gymkhana as it is entertaining to play in events where you have to try and take down objects on an open course and spinning doughnuts in compacts spaces to earn points towards medals. There are a huge amount of cars as you unlock more with each level gained from rep points, also used to unlock additional events. Die hard off road racing enthusiasts should change the settings immediately as the assists nerf the hell out of the gameplay, but it doesn’t take long to get a hold of the controls and upping the difficulty levels to help gain more rep points to help level up faster. Like I said about being torn on the gymkhana events, they are in fact fun, but do not have the same fulfillment I get by bombing down a point to point event wide open sliding around corners trying to avoid trees and rocks. 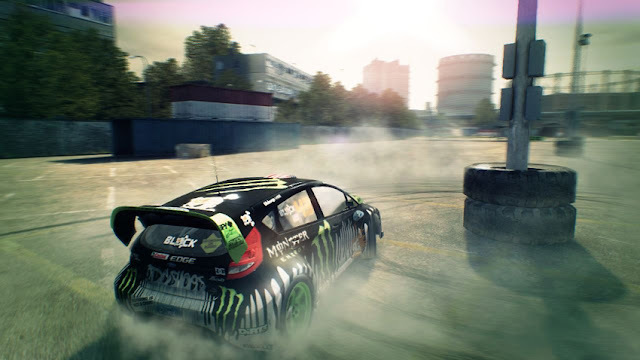 However the gymkhana drifts could be a blast when played toe to toe against someone on the same skill level. Also, I miss the old RV interface, as it made you feel more like you were on tour crossing the country, whereas now you have this interface with shapes floating by your car and you are not able to modify your car and liveries like the previous entry. Lastly, the collision detection does not feel as spot on as the last game, but this may be resolved in an upcoming patch. 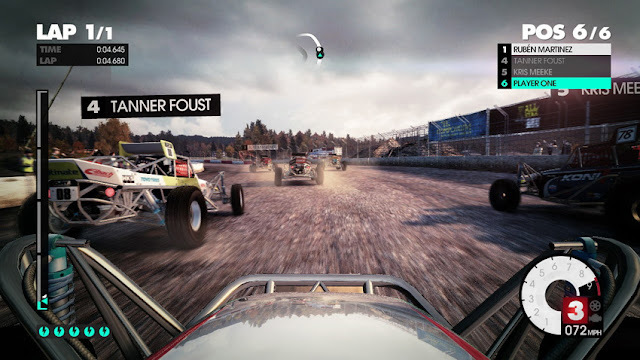 All in all, DiRT 3 is a blast and a perfect addition to 2009’s DiRT 2. Little gripes aside, it is a DiRT title through and through. There are plenty of events to up your rep and unlock vehicles to take online with friends and strangers. You are able to upload YouTube videos, but unfortunately with this feature there will probably be many user submitted videos that don’t help hone your strategies. Like the second, there is a lot of replay value and with races only lasting a couple minutes at a time is it easy to pick up and kill a half hour of free time or just lose yourself for a couple hours, leaving you wondering what happened to the day. I hope to see you all online and feel free to challenge me to a race or two. 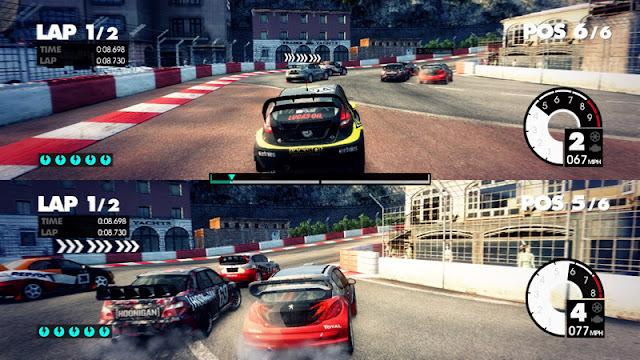 Kudos again Codemasters, now when will we get a peek at GRiD 2? 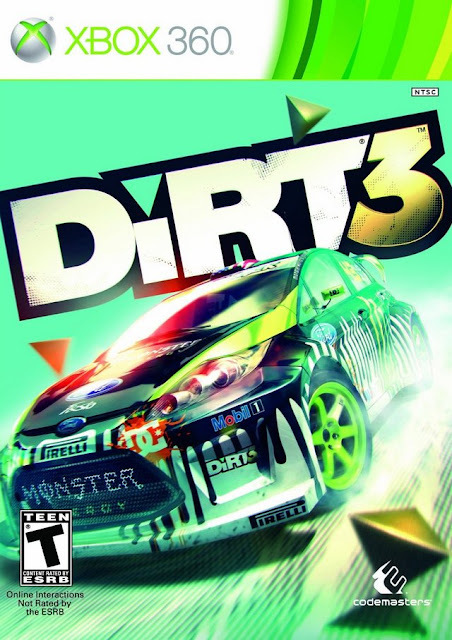 MashButtons gives DiRT 3 for the Xbox 360 a 9 out of 10.